Back in May, I snapped this photo on my subway ride home one evening. I don’t think he saw me, but even if he did I doubt he would have cared. He’s sitting on the floor of the subway car. That’s even too dirty for homeless people. He’s sitting right in front of the door that’s going to open at the next stop. He’s spread out as though he were sitting on his carpet at home. 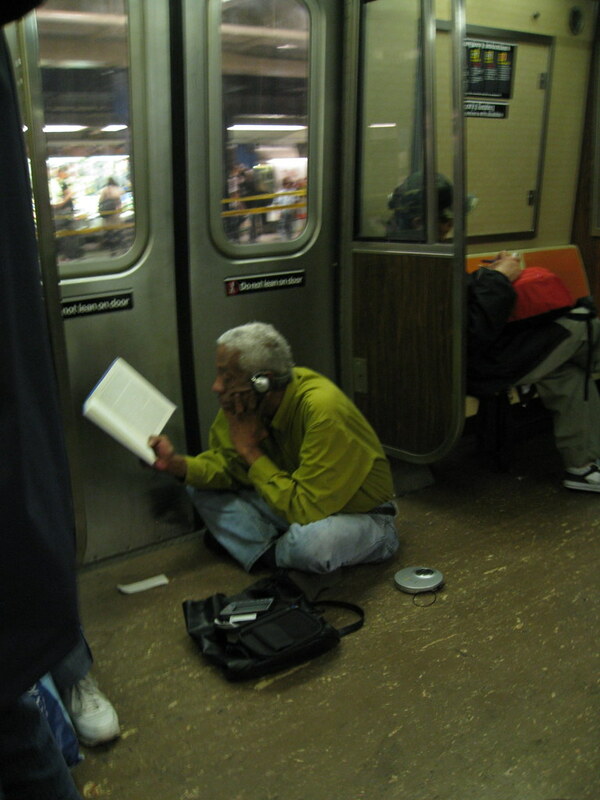 He’s sitting comfortably, his bag is wide open, his bookmark is set out in front of him, he’s got his tunes on. He’s listening to a Discman. Who still owns a Discman? Though it may seem that he chose this spot because all the seats were taken, you’ll notice that the kid on the right is sprawled across three seats. He’s well-dressed and not immediately identifiable as insane. Best of all, I seemed to be the only one on the train who thought this was unusual behavior. The lesson here: people don’t always use things as they’re intended to be used. Sometimes a design is open enough for it to accommodate the needs of an outlier. And most people will tolerate it.